Beginning in 1930s Silesia (now part of Poland, Germany and the Czech Republic) we follow three childhood friends, Max, Werner and Hanna as they explore their love of aviation, all dreaming to be pilots one day. Even at a young age it doesn’t escape them that one of them is a Jew and one is female so their opportunities to fulfil their dream are limited. As the Nazi’s rise to power the children’s friendship is torn apart when it’s apparent that Werner must join the Hitler Youth in order to fly and Max’s family shop is attacked for being run by Jews, forcing the family to flee to America. It’s at this point the three friends make a pact to be friends for life. By the time the war is in full swing Max and Werner are skilled pilots on opposite sides of the fight, and it comes to the attention of the US that Max is either not who he seems or, potentially, a way for them to strike a serious blow against the enemy, and somehow this plan involves Hanna. 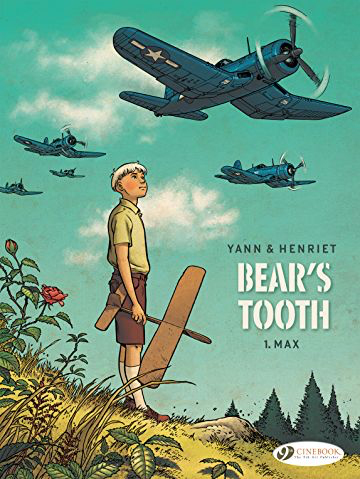 Bear’s Tooth tells a story of the war through the eyes of three friends, using a non-linear narrative to explore their friendship, hopes, failures and challenges, and encapsulates the absurdity of a war that divides countries and people and throws them against one another. This opening volume sets the tale up superbly as Max, Werner and Hanna all strive to fulfil their ambitions despite the changing world around them, and with little thought to the ultimate destination of the paths they set out on. Comic storytelling has the ability to open up so many new avenues of storytelling, and here we have a prime example of a different perspective of WW2 told from outside of the usual viewpoints. I’d never heard of Silesia prior to picking up this book and that detail alone has opened up new paths of discovery for me. Henriet’s artwork, coupled with Usagi’s thoughtful colour palette, captures the period perfectly, with some excellent depictions of military aircraft and ships. Where a movie will spend millions on CGI effects to realise such vehicles, artists like Henriet drag you straight in to the action at a fraction of the cost but with all the drama. If this first issue is anything to go by then Bear’s Tooth has the potential to be a thought provoking and memorable series.